Our both demos you can get also on limited edition of CD-R. It contains first "One Of Neverending Possible Progressions And Variants, Which Rise Maybe..." and also second record called "Sole Light Point In Void Tangle Of Luminous Rays Of Incompatible Directions"
In January 1999 after big changes in line up the band PARASOPHISMA released their second record called "Sole Light Point In Void Tangle Of Luminous Rays Of Incompatible Directions", which consisted of seven songs, surprising thus the world with their experimental mixture of doom-death-heavy metal with jazz elements and enchanting flute and female vocals. 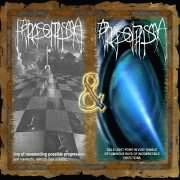 Parasophisma was born in 1994 and a year later, the first demo entitled "One Of Neverending Possible Progressions And Variants, Which Rise Maybe..." was released. The demo, which was compared to the early production of My Dying Bride by the public, was spread in the circulation of 450 copies. The band PARASOPHISMA recorded their third record called "A variable invariability varied in dependency on variations caused by the invariability of invariability remains the same when all the variations of fractals of delight have been done ", which consisted of eight songs. The music has a touch of psychedelia, is more aggressive, especially in vocal expression, but it looses nothing from the melody aspect which is a necessary attribute of the band´s expression. The Contrariety of Someone´s Generally Recognized "Common Thoughts"